Country hams are the traditional hams that date back to the days before refrigeration. These cured hams are soaked in a saltwater brine and smoked to preserve them. Today processes may vary but essentially this ham is salty and dry. Now, this might sound like a bad thing but really it isn't. A country ham, properly prepared is a delicious treat. When you open up your country ham you might not like what you find. A country ham looks dried up and can be caked in mold. Sitting around, curing for several months causes this moldy appearance. Don’t worry, as long as the mold is only on the surface, the ham is fine. Just scrape off the mold and you’re in business. The first step to preparing a country ham is removing the excess salt. Country hams are salt-preserved, meaning that they are dried in salt. This makes them too salty for consumption. To remove the salt, you need to soak the ham. Consider this a reverse brining. By soaking the salted ham in water, the salt is drawn from the meat while adding moisture. Some say it's necessary to soak a country ham for about 6 to 12 hours. If you have a small ham, around 4 to 5 pounds this might be okay, but I personally like to soak my ham for a long time, about 2 to 3 days. You want the ham to stay cold during the soaking process, but not as cold as your refrigerator. A cooler works perfectly for this as it provides enough space and keeps the temperature under control. Keep the temperature around 40 F for the best result. Remember to have the temperature low enough to keep any bacterial growth at bay. As the soaking pulls the salt from the ham you will want to change the water about every 12 hours. This gets the salt out of the way and allows more to come out. When you change the water you should also give the ham a quick rinse to get any salt off the surface. The soaking will rehydrate the ham and make it more edible. Once the soaking process is complete, it is time to cook the country ham. While the ham is ready to eat, it may have been exposed to bacteria while immersed in water so, cooking it at this point is important. 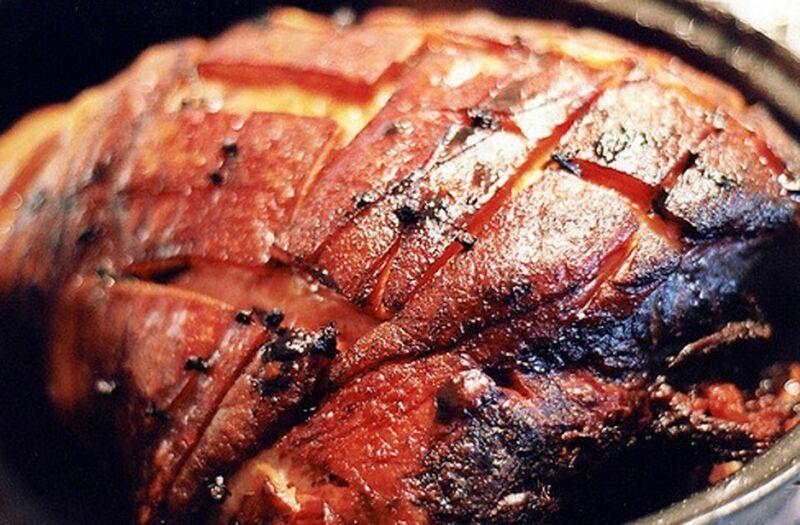 Cook the ham at a low enough temperature to get the internal temperature up to 160 F. While roasting it in the oven is fine, though, the added flavor from a smoker or grill makes the ham much more flavorful. If you put your ham on a grill you will want to cook it indirectly at a low temperature. I would suggest putting a pan of water under the ham to catch any drippings, but more importantly, to keep the cooking environment moist. You should also baste your ham periodically to prevent it from drying out. A good baste for a country ham should be sweet and acidic. Dr. Pepper works well for hams, honestly. At a low grilling temperature of about 300 F, your ham should be finished in 3 to 4 hours. Watch carefully to avoid burning. A country ham can be forgiving but letting it burn up on the grill is unforgivable. If you are going to smoke your country ham, keep the smoke levels low. A country ham typically already has a smoky flavor to it. Adding too much smoke can make it bitter. Baste frequently and keep the temperature around 250 F for 5 to 6 hours. Of course, you can go longer but the benefit of smoking declines over time. You might have noticed that this process takes time. Plan on starting out with your country ham 3 days before you need it. Yes, it is somewhat of a project but well worth the effort and the actual time spent on it isn't too long. You’ll have plenty of extra time to prepare other items for your holiday feast. How Do You Cook a Perfect Pork Chop on the Grill? What Are Some Delicious Ham Recipes for Your Next Barbecue?